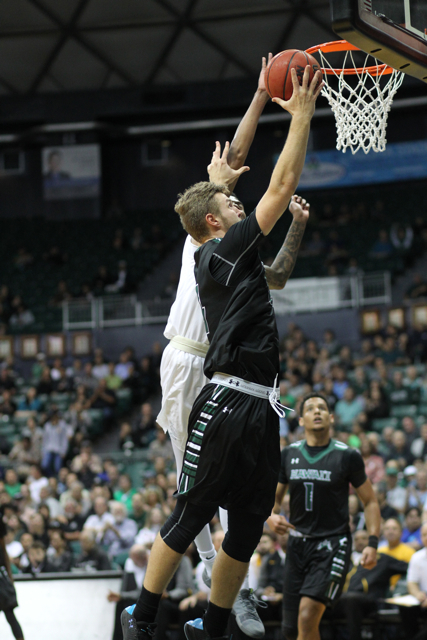 Zigmars Raimo scored a career-high 17 points and grabbed four rebounds off the bench and Gibson Johnson added 13 points and five boards tonight to help Hawai’i speed past visiting Long Beach State, 74-63, in Big West Conference men’s basketball action. A Stan Sheriff Center crowd of about 4,200 watched Drew Buggs contribute 10 points and eight rebounds and Brocke Stepteau add 10 points and six boards as the Warriors improve to 16-10 overall and 7-6 in the Big West with their third straight victory. The 49ers, who defeated UH, 89-81, at Long Beach on Jan. 4, fell to 13-16, 7-6. The Warriors led 15-10 in the early going and extended it to 34-25 by halftime thanks to 53 percent (16 of 30) shooting from the field and control of the backboards (21 rebounds, compared to 14 for the 49ers. Long Beach State shot only 30 percent (9 of 30) from the field in the first half. The 49ers closed it to 46-42 after Barry Ogalue’s two free throws capped a 10-3 run with 10:25 remaining, but Hawai’i answered with six straight points to push the lead to 52-42 and Long Beach State could not get closer than eight points the rest of the way. Hawai’i played without leading scorer and rebounder Mike Thomas, who sat out for his second consecutive game with an undisclosed injury.